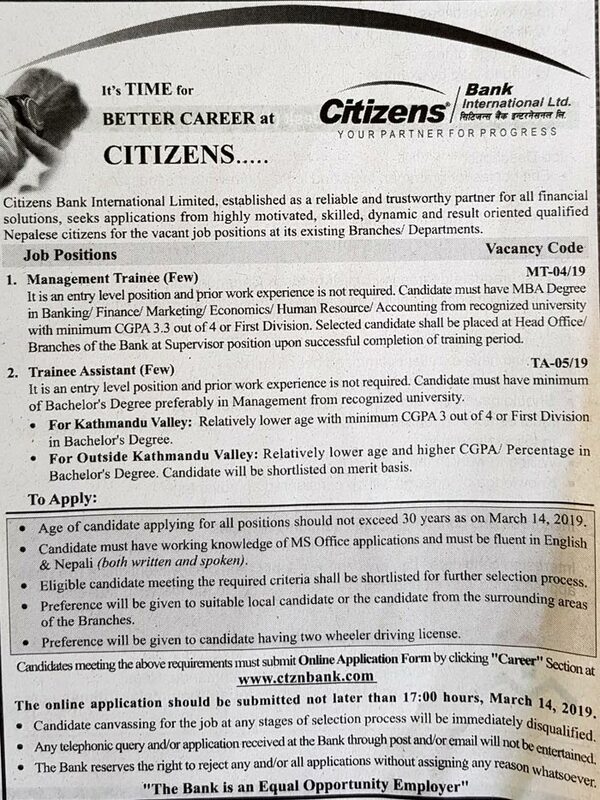 Citizens Bank International Limited, established as a reliable and trustworthy partner for all financial solutions, seeks applications from highly motivated, skilled, dynamic and result oriented, qualified Nepalese citizens for the vacant job positions at our existing Branches/ Departments. It is an entry level position and prior work experience is not required. Candidates must have minimum of Bachelor’s Degree preferably in Management from a recognized university. The eligible candidates meeting the minimum qualification shall be shortlisted for further selection process based on the following criteria. Relatively lower age and 1st division or 3.00 CGPA (out of 4) in Bachelor’s Degree. Candidates obtaining 1st division in Master’s Degree only will not be considered. Relatively lower age and higher percentage/ CGPA in Bachelors Degree. Candidates will be shortlisted on merit basis. > Age of candidates applying for Management Trainee and Trainee Assistant should not exceed 30 years as on March 14, 2019. > Candidates must have working knowledge of MS Office applications and must be fluent in English and Nepali (written and spoken). > Preference will be given to suitable local candidates or the candidates from the surrounding areas of the branches. > Shortlisted candidates shall only be informed about further selection process. > Preference will be given to candidates having two wheeler driving license. > The online application should be submitted not later than 17:00 hours; March 14, 2019. > Candidates canvassing for the job at any stages of selection process will be immediately disqualified. > Any telephonic query and application received at the Bank through post and/ or email will not be entertained. > The Bank reserves the right to reject any or all the applications without assigning any reason whatsoever.